Travel Book Launch - Three men ride South - Ghumakkar - Inspiring travel experiences. After enjoying the celebration and success of his first travel book, he never stopped. He rode on to travel more and pen down more of those epic journeys in his anecdotal books. He is one person who has traveled through the length and breadth (almost!) of India and all with his amigos and on theirmean-machines. I am talking about Ketan Joshi, the fine writer and the real Ghumakkar whom we met here at Ghumakkar not too long ago. Recently, Ketan and I caught up in a conversation and a lot about the year that was (July ’17- July’18) got spilt over the table. Meanwhile, I also tried to gather some first-hand information about his recent Travel Book Three men ride South. Our conversation’s uncut version is here. Take a read for yourself! G: A year has passed by since Ghumakkar got introduced to Ketan. Take us through the things that have happened over the year. Ketan: A lot has happened – both good and bad. The bad being that mother passed away almost exactly a year ago, after a long fight with cancer. It was a very tough period for all of us. But she saw my first travel book ‘Three Men on Motorcycles’ published and hitting the top of the charts, and that made her very happy. The good part was that I traveled a lot and wrote a lot! Amidst this, there was an amazing that happened too! I was interviewed by team Ghumakkar. G: Sorry for the loss of your mother, condolences. Appreciate your courage to travel in spite of all odds. And we just love that one “amazing thing” part – we are glad that we interviewed you then and now, again! G: Take us through those journeys. The Ghumakkar in me is all ears. Ketan: I totally understand! Since the trips and my books go hand-in-hand, I shall talk about both,concurrently. G: Sure Ketan. Please go ahead! Ketan: Thanks! 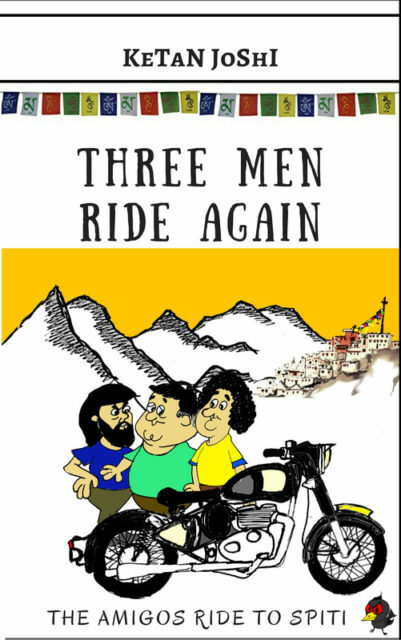 So, I wrote and published two more books in the ‘Three men’ series – ‘Three men ride again’, which was about our ride to Lahaul Spiti, and ‘Three men ride south’ which was about our ride in the opposite direction – from Mumbai to Coorg via Konkan, Goa and Mangalore. I did a couple of long motorcycle rides – one to the Himalayas where we did the ‘most dangerous road in the world’ – the Kishtawad – Killar ‘cliffhanger’ and Sach pass and then onto unexplored Ladakh. The other ride was exploring the coastline of Gujarat – from Bhavnagar to Jamnagar and then on to Rajasthan, and then back to Mumbai. 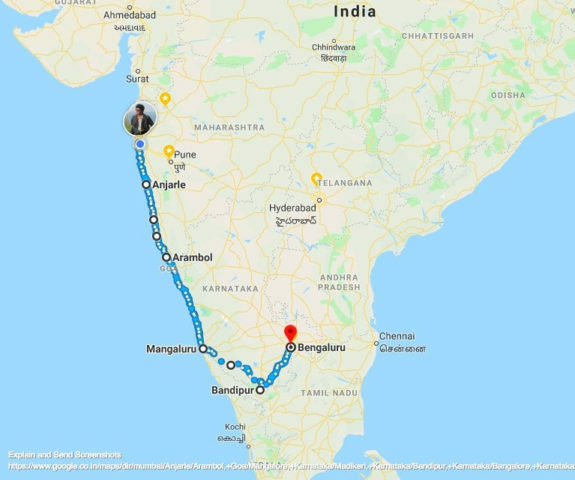 I also did a long bicycle ride, along with my wife – from Mumbai to Goa by the coastal road. We took a two month summer holiday! We spent one month in Iran – which was an amazing place. It was really a most pleasant surprise. And then three weeks in Indonesia in the little known Flores island and Komodo island, where we met the Komodo dragons- and then I went on a quick side trip to Cambodia to see the amazing Angkor Wat temple complex. G: Whoa! That indeed is a lot and with such variety, amazing! Ketan: Thank you! That humbled me! G: Tell us something. Do you set some goals for yourself about the number of places to be seen and the number of books to be written? Ketan: Not a predefined goal as such, but I hoped to finish 3-4 books this year. Only one has come out so far, due to the hectic schedule this year – so I am running a bit behind schedule. Since I have done a lot of travelling – not just motorbiking, but backpacking and flaspacking as well – I have a lot of travel stories to tell. I am hoping to do more Amigo motorcycling travelogues, then a couple of backpacking books, a bicycling book and maybe a few ‘Travels with She-Who-Must-Be-Obeyed’ all across the world. Let’s see how that pans out. G: It sure will be interesting to read about all that, good luck! Ketan : Thank you, again ! 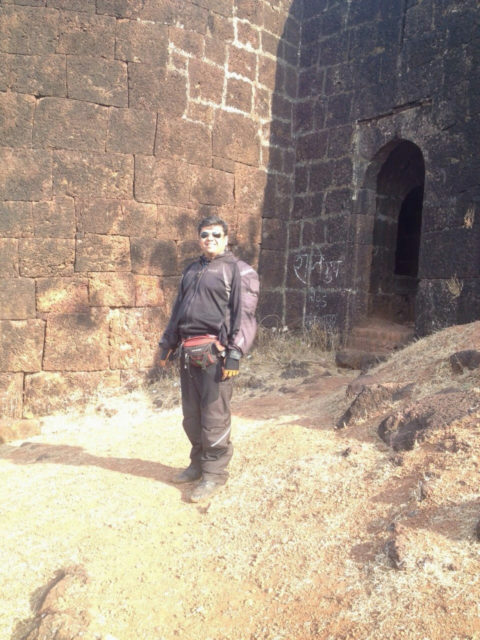 Ketan: Yes you are definitely right – not all trips are worthy are being a book. The trip has to be of a certain length to have content, have a lot of fun experiences to talk about and be in areas which have something interesting in terms of history, geography, culture etc – and preferably be off the beaten track. This South trip was replete with fun experiences. Firstly, it was not a planned trip – it was supposed to be a short weekend ride, where five people would ride from Mumbai to Konkan and back. 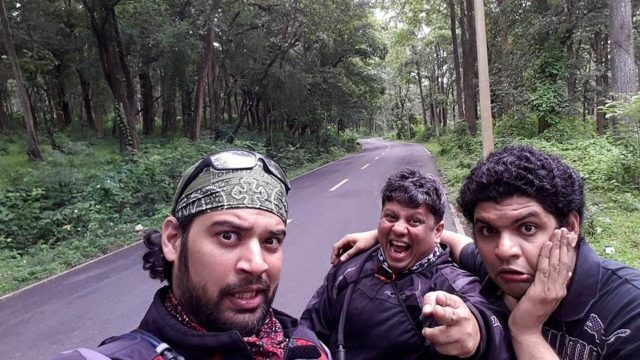 But there, two of decided to continue the ride and go on to Goa by the coastal route. 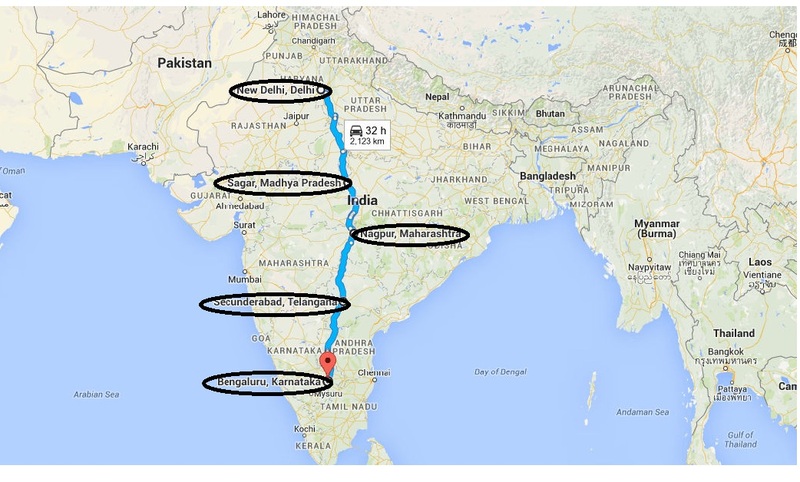 After we reached Goa, I decided to explore the konkan coast into Karnataka and carried on to Mangalore. Thus what was intended to be a small ride extended to become a 700 km + ride. The amigos returned to Mangalore and rode to Coorg and Wayanad and then explored the jungles of Bandipur and Muthumalai and then carried on to Bangalore to meet old riding companions. An important element in the ride is the country we rode through – the Konkan coast and the Western ghats. The Konkan coasts have such an interesting history and are home to so many different cultures and have absorbed so many immigrants from across the sea – Scythians and Parsis from Iran, Jews and Syrian catholics from the middle east, Abyssinians from Ethiopia, etc. The western ghats are a UNESCO world heritage site and are home to some of India’s finest jungles and wildlife. Both of these places are not as well known and respected as they should be, and I wanted to tell the story of the region in this book. I hope that this book will make more people aware of the amazing richness and diversity of the place. G: That sure is compelling to write a book. Talking about the cover page of the new book, it is, like the previous one, very casual. Am just curious this time about the pictorial hint on it. The Elephant! Tell us about this. Ketan: These amazing covers are created by our talented fellow Amigo Aditya Dhurandhar. @mowgli2806. I did not want to use a ‘standard’ bike photo, or photo of riders – and Adi understood what I was saying and custom-created these illustrations and cover, and did a wonderful job. 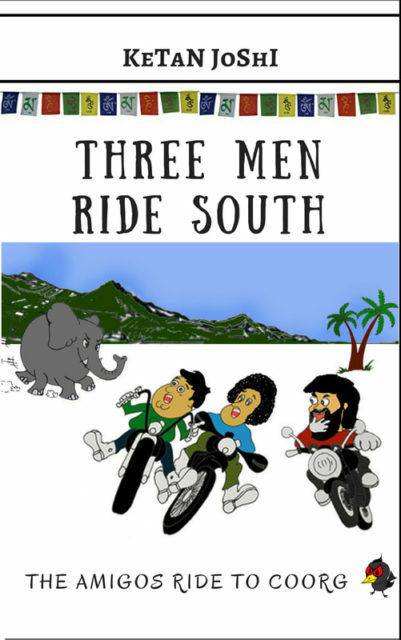 This ‘Three men ride South’ cover does indeed illustrate a story from the book. We saw a herd of wild elephants on the road in Bandipur, and the mother elephant got irritated at our taking photos of the baby elephant and did a mock charge at us and scared our pants off! We ran for our lives! If I say more, I might kill your curiosity to read the book. Do take a read yourself and I hope you will like it! G: Definitely Ketan! I will and so will many Ghumakkars who, I am sure are already excited to grab a copy of your book. They say “ A great book begins with an idea; a great life with determination!” For a man like Ketan who has ideas, books and determination – all together , we shall wish for a great life too. May this book along with all your other endeavours bring more accolades to you. Good-luck Ketan! We hope to see you around more often here at Ghumakkar. That gets this post to a closure. On behalf of Team Ghumakkar, I shall promise to be back soon with more such success stories to inspire and entertain you. Thanks Archana ..I enjoyed every bit of ‘Three Men Ride South’ especially after Six Days of our Southern Sojourn. You are a GREAT story teller with an ability to carry readers along with YOU. God bless..keep doing the good societal work towards tours and travels. Thank you Col Bhatia! I am so happy to hear that. Do try out the other Amigo books as well and let me know what you thought of them. The road from Nagpur to Hyderabad is a love hate relationship the moment you start loving the road it turns horrid, we started early, a strategy that has helped us get out cities in time and got on the NH 7.